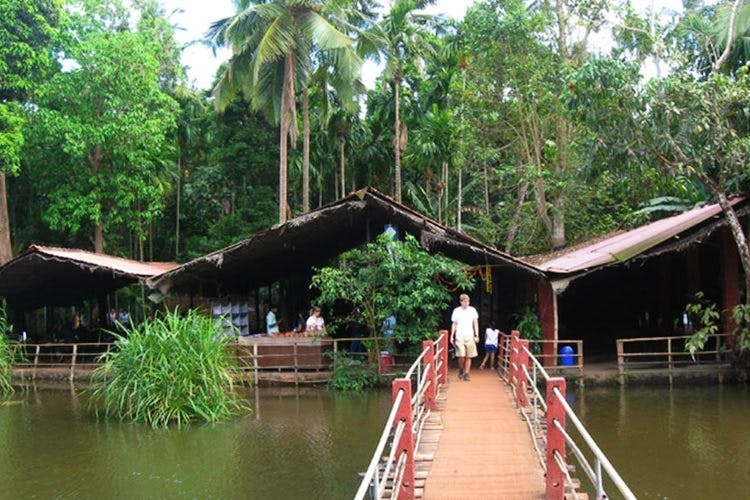 Tropical Spice Plantation is located in Keri, a village untouched by pollution, 6km off Ponda in Goa. It is perfect for people who want more than the cliches from Goa. You get to see a range of spice plantations, see the experts climb and fetch a fresh coconut, experience a bath by an elephant and then you will be served an organic lunch prepared from the plantation’s produce. Cherry on the top – you will get to taste in-house feni. I loved the hospitality and the professional conduct by the staff. Tropical Spice Plantation is spread over large tract of verdant land, which offers the perfect setting for you to soak in pure unadulterated nature. They welcome their guests in a traditional way by offering aarti, kumkum and a garland of flowers. Then the guests are served herbal tea. Healthy and nutritious food is served in a traditional manner on a banana leaf. The Tropical Spice Plantation guided tour will refresh your senses and make you feel a part of nature. Indulge in a riot of colors in their butterfly garden, as the latest additions to our already magnificent ecosystem fly around. Delight in the sight of over 75 spices of birds within the plantation. Catch sight of some vary rare and endangered species of birds. Tropical spice Plantation can be reached from Panjim via Mardol. The cost of entry is INR 400 per person. It is best to go there when Goa is slightly cooler and less humid.